Joe Crawford blogged this at 6:30pm in 2008 in November. The 25th was a Tuesday. You are reading this 10 years later. Comment. There are 6 comments Tweet. Send email. It has hashtags→ funny photos religion . Your friend request is quite nice. This is absolutely hilarious, thanks for sharing the photo! 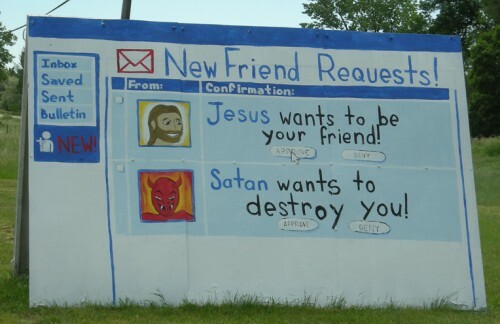 except, it would be better if the swicthed the words jesus and satan? Good god, does myspace have a “report spam” feature? Yes…good to see that religions are getting with the times in their marketing/recruitment efforts. This is clearly marketed at kids…perhaps their should be the same restraints on marketing religion to kids as their is for alcohol and cigarettes. After all, religion is just as bad for your health.